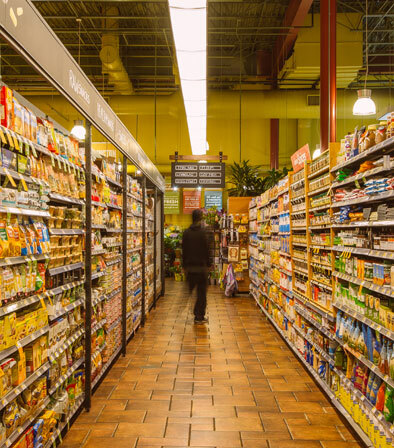 This Whole Foods Market is located in a tidy part of its Washington suburb, with close proximity to the County Court and convenient DC Metro stations. With high levels of foot traffic, this is a high volume store. Whole Foods Markets, mindful of this, decided to implement a new Prepared Foods Venue into the renovation. The idea was to open up the store’s produce area while at the same time refreshing the prep areas, the seafood area and most of the refrigeration equipment. The store remained open during construction, so work was done at night. The project was phased into three parts to minimize the impact on store activity and sales (each morning the store had to be handed over in a pristine condition, ready for customers with high expectations). Nevertheless, it was entirely completed over 12 weeks. Getting all the mechanicals, refrigeration, storefront and finishes completed in this time posed a difficult task. Unforeseen underground conditions were a big obstruction. With a 20-year-old building, existing tie-ins were difficult to locate and different services clashed in the trenches. All potential pitfalls were overcome, however, with the project delivered on time to ARA’s trademark high standards. Our daily communication and awareness of our surroundings meant as little impact to Whole Foods’ store operations as possible. A unique point in this renovation was the addition of a new prepared foods venue. The venue was conceptualized based on a food truck, with the design fitted into an existing vestibule so that food could be served to customers on the street. Some storefront renovations, along with mechanical upgrades, were necessary in order to cater for the new venue’s equipment. New cooler boxes were added for seafood and produce, allowing for the elimination of the old, and the enlargement of the produce section.